Better Than First by Kari Trumbo is the most delightful Christian romance that is set around Christmas but you do not have to wait until the festive season to read it! It’s a wonderful all-year round read. 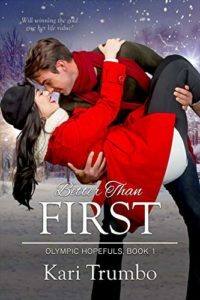 Once again Kari Trumbo has created wonderful, warm and welcoming characters who will lodge in your heart. The lead characters bounce their dialogue off each other, exuding love and friendship, to the delight of the reader. The backdrop of snow adds to the festive feel. Sometimes things that look good have a dangerous edge. We can see parallels in life… not everything that looks good is beneficial for us. 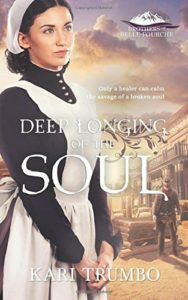 Deep Longing Of The Soul by Kari Trumbo is a delightful Christian historical romance set in 1900 that will warm your heart. The novel has the themes of faith, trust, fears and forgiveness. Our past cannot be altered, by dwelling in and living under guilt, we are not living the good life that God intended for us. We must face our fears and our guilt, forgive ourselves and move on into the future. God can be trusted to give us just what we need, just when we need it. He will send the right people to help us at the right time. God is never early or late. His timing is perfect but not always the same as ours. There is the theme of healing – of the body and the soul. Sometimes it is easier to mend the physical body than the spiritual one. 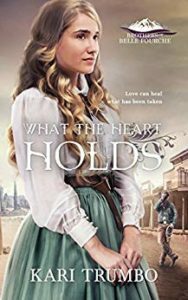 What The Heart Holds by Kari Trumbo is a delightful Christian historical romance set in 1899. The novel is a light hearted, fun read sure to bring a smile to your face. The banter volleys backwards and forwards between the two lead characters – both maintain independence but with an air of vulnerability. The past has a habit of intruding on the present and future if we let it. The past is gone. We need to learn lessons from it and move on. Grief can trap us. The grieving feel a series of emotions including guilt. “Stop acting like you don’t deserve to live.” Our lives must move on. 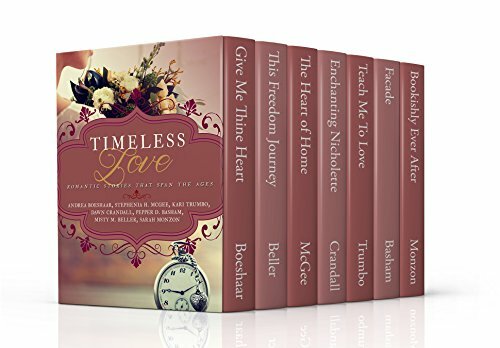 If we lock up our hearts, we will never hurt again – No! If we lock up our hearts we merely imprison ourselves. We miss out on life. We must learn to live and love and trust again.